I’ve been weaving for six years. In weaverly terms, that’s really nothing. I read articles, blogs, and posts on Weavolution by women and men who’ve been at this craft/art for half a century. Heck, my first weaving class was taught by a man in his 80’s who learned to weave rag rugs as a boy during the Depression to bring money into the house and never stopped. So six years is a drop in the bucket…one or two strands in a warp, a few throws of a shuttle…insert your favorite metaphor. On the other hand, one common statement about how to get good at something is to do it for 5,000 hours. Many weeks I spend 30-40 hours researching, planning projects, sitting at the loom, or fringing and wet finishing. Even when I factor in the fact that some weeks that drops down to about 20 hours, my calculator tells me that I’ve worked at weaving for well over 5,000 hours in those six years. However, in addition to weaving for only six years, I live in the sticks two hours from everywhere, so most of my weaving is very solitary and predominantly learned from books and the old trial-and-error method. While I may have woven miles of a particular weave structure, I may not have a clue about the correct terminology for that structure. A case in point – drall. I’d seen it in print, read it on the net, attempted to have people explain it to me in words (unsuccessfully, I might add). It wasn’t until I was finally pointed to a draft for it and accompanying weaving resources that I understood. OOOOHHHH. 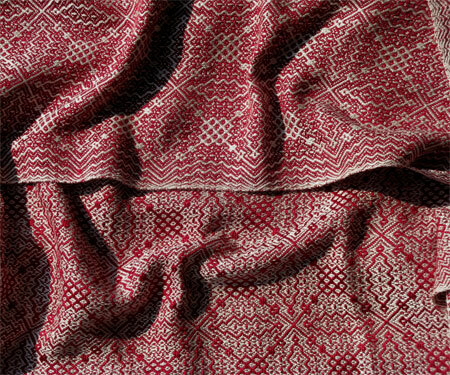 Drall is a classic Swedish term for a particular arrangement of what others (me included) call a 3/1 vs. 1/3 twill. Took me a good two years to figure that out. Similarly the term gebrochene. My reaction is gebro-what? What is that? How do I even pronounce it? How many harnesses does it take? Again, gebro-what? Then not too long ago I purchased some magazines from a weaver who was downsizing her stash. One of them, Weaver’s from winter, 1997, had an article on gebrochene. Ahhhh….based on some historical weaving, gebrochene is a German term for a modification of what I (and others) call Ms & Ws. I’ve woven Ms & Ws plenty of times, and some modifications of it, to date always on my 4 shaft counterbalance loom. This article whet my whistle for an 8 shaft pattern on my Mac. So I sat down with my computer software, drew in a threading that pleased me, figured out that I’d need to use fine threads to get enough pattern repeats to make me happy, and then played with a variety of tie ups. I ended up using the following draft. 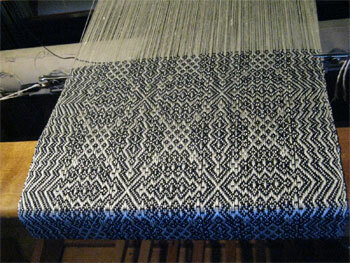 I wound a warp of 260 ends of 20/2 undyed silk (about 8,000 yards of thread to the pound) and got it on the Mac. Threading went smoothly, I was set to weave. For the first scarf I used a black weft. Although I’m not usually a black & white gal, this is my favorite of the three scarves. For each photo I’ve shown you the ‘front’ and the ‘back’ of the scarf. I can’t decide which side I like better. For the second scarf I picked a Pacific blue silk that makes me drool. It’s so richly colored and has such a terrific sheen that I paid top dollar for it when I saw it in a store. Woven in this scarf, the mix of the white and blue really tones that color down more than I would personally choose. I’d probably like a scarf woven with all the blue. Where could I purchase one of these scarves? Your work is beautiful! I love the draft image you provided for the silk scarves but can’t read it very well. Would you consider emailing me a wif file? I would normally enter it into Pixeloom on my own, but in order to do that, I have to be able to see the original very clearly because I have double vision. Thanks so much for considering my request. Happy to do so, Pegi! Your scarves are lovely and so drapey. Thanks for explaining gebrochne. Could you please send me a copy of the .wif. I’d love to weave this for my daughter in laws. Thanks so much. Will do, Mary. Check your inbox, and enjoy! These are gorgeous. May I get a wif copy as well? If you can find your draft for this particular scarf, could I as well have a copy? I’m like you out in the sticks, and feel very isolated from any weaving community. In April I bought an Öxabäck Lilla loom and I’m haveing a blast. In the future if you need any Swedish terms translated, I would be happy to help you. Kristina – Do you want a wif file, or a simple jpg of the weaving draft? I’m happy to send either. Peg, your scarves are so lovely! Would you please consider sending me the wif? Hi there. This is lovely. I’ve been thinking I’d like to make a modified version of the Margie Thompson Gebrochene silk scarf in Weavers (reprinted in Best of Weavers Twill Thrills). I’ve been thinking I’d like to add a border. Now I’m sure. Lovely. Thanks, Nancy. Enjoy your weaving! Very beautiful. Just bought an 8 shaft loom. Would lové to try this draft but can’t read it. Could you please send me another pdf or ? Thank you. Keep up the good passionate work. Check your email, Denise, and happy weaving! I would also love to try this draft. Like the others, I am unable to read it. I would so much appreciate receiving a copy from you. Your weaving is beautiful. Peg, your scarves are beautiful! 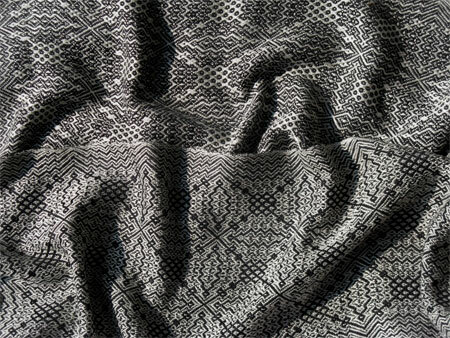 Would you please send me the pdf file or jpeg file for this pattern? I have not been weaving for many years but I love a challenge because I learn so much more and your pattern is inspiring. These scarves are beautiful. Can this be sent as a PDF file? 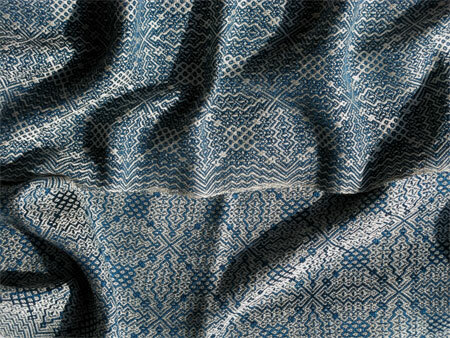 I have some 20/2 silk coming that I would love to weave this pattern with. Thank you. Check your email, Janet. I’ve sent it as both a jpg and a pdf for you. Thanks for sharing pattern for your beautiful scarves. Please send me both jpeg and WIF?